It tastes like a pie! And a muffin! But serioulsy, it tastes like apple pie. Warm apple pie if you eat them hot out of the oven like it did. Two wonderful buttery worlds collide and the resulting muffin is everything you need this Thanksgiving. Thick juicy apples rolled in a sweet spicy mix of cloves, cinnamon, nutmeg and ginger. It all comes together to form a delicate muffin. The brown sugar oat crumble on top is the perfect pie (muffin) crust. 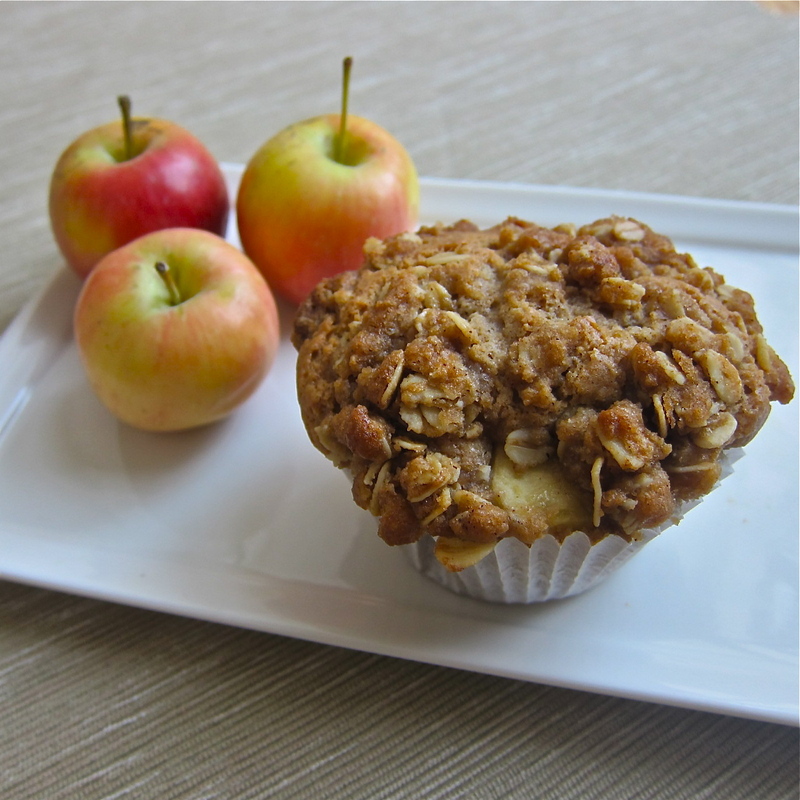 Make sure to leave your apples in fairly large chuncks so they do not disappear into the muffin. This is afterall all about the apples. I used some beautiful tart honey crisp apples in this muffin. If the thought of baking a pie for Thanksgiving is a little daunting, then why not bake apple pie muffins instead? I mean who doesn’t love muffins? I do! Preheat the oven to 375 degrees F. Line 12 cup muffin pan with paper liners. In a large bowl whisk together flour, pumpkin pie spice, baking soda and salt. In another bowl whisk together the egg, sour cream, milk, butter, vanilla and brown sugar. Stir until sugar has dissolved. Pour wet batter into dry ingredients and stir until just combined, do not over mix. Gently fold in apples. Fill muffins cups to the top. In a small bowl stir together brown sugar, flour, rolled oats and cinnamon. Drizzle melted butter over the top and mix until blended. Sprinkle crumble over top of the muffins. Bake in preheated oven for 25 minutes or until the tops of the muffins spring back when lightly pressed. Cool on wire rack. Store at room temperature. What a great combo… Would you call this a puffin? Puffin! Yes! Anna is brilliant. I would be thankful if you brought me a muffin right about now. Thanks! Excellent. You made them so special.